The hunter green color of this authentic emerald gemstone in Apples of Gold Jewelry's women's emerald solitaire cross necklace for women in 14K white gold is sure to please even the choosiest among jewelry collectors! The soft, yet vivid green of this AA rated emerald gemstone, which measures 2mm, is the perfect way to give this plain and polished cross pendant a little extra personality! The gemstone is bezel set into the pendant, which measures 1.20 inches in height and 0.65 inches in width. The solitaire gemstone adds plenty of excitement to the pendant, and is perfect for daily wear to keep a symbol of your faith with you always. "Thou wilt shew me the path of life: in thy presence is fulness of joy; at thy right hand there are pleasures for evermore. "(Psalms 16:11). 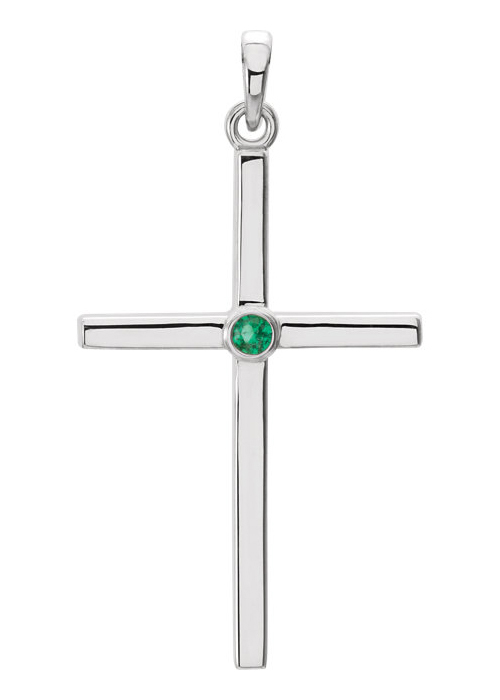 We guarantee our Emerald Solitaire Cross Necklace, 14K White Gold to be high quality, authentic jewelry, as described above.